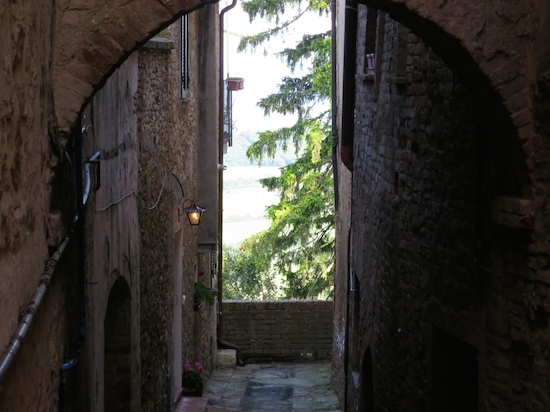 Montepulciano is a must-see, if you’re in Tuscany; a medieval walled town with tiny narrow streets and the most incredible views from the outer wall. 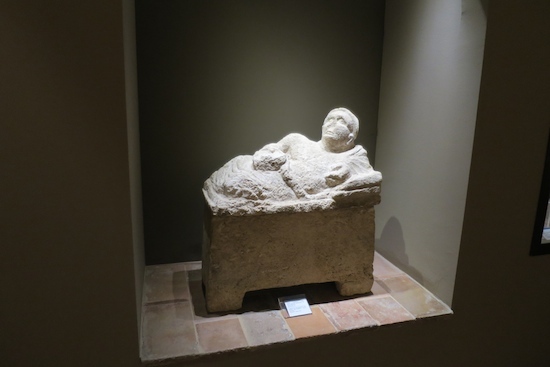 It also has a Torture Museum but I’d rather not talk about that (it made me feel nauseous and faint, especially the death-by-impalement part) – again, feel free to read my travel review over on Mr and Mrs Smith. 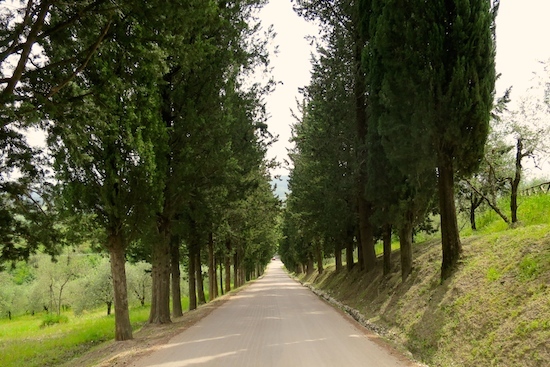 But onwards, troops, onwards through the rolling hills and then up a tree-lined road to the magical, secluded Castello di Casole. 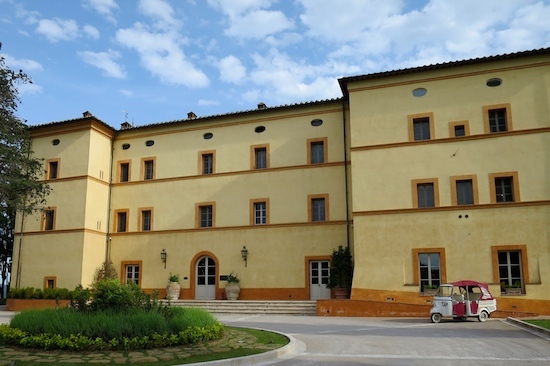 Sitting on one of the largest private estates in Italy (4,200 acres), this hotel is a kind of luxurious, grown-up, Tuscan Disneyland where absolutely all of your needs can be catered for without you having to set foot outside of the grounds. You may prefer a more rustic approach to holidaying; old, crumbling farmhouses with ancient, gnarled trees that creak in the breeze and plumbing that screams when you flush the toilet – Castello di Casole has all the visual charm of the rustic but, at the same time, it provides all the convenience and comfort you could possibly wish for. 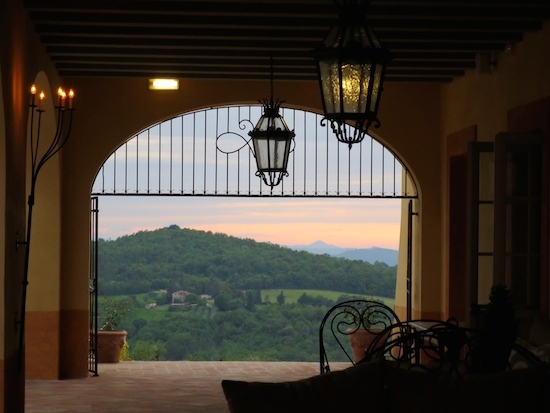 The people behind Castello di Casole, Timbers Resorts, have done an exemplary job of turning the old and traditional into something very plush and marvellous. I say turning, I suppose I mean tweaking. Very expensive tweaking. Because the whole place is still old and traditional – the remains of a real Roman amphitheatre lie next to the swimming pool, for goodness’ sake! – it’s just that it has all been buffed and terracotta-floored to perfection. It feels as though the original Castello and surrounding buildings have never been touched; but of course they have. Just in a very expert and sympathetic way. Everything from the finish on the sun-baked walls of the Castello to the stone floors in the bedrooms seems authentic; yet at the same time it’s all beautifully pristine. As it should be, I suppose; the hotel wasn’t renovated very long ago, and they spent a fortune doing it. I particularly loved the views; wherever you look from the hotel, there’s a simply stupendous view. I suppose it helps that your hotel is surrounded by 4,200 acres of your own estate – it’s not as though you’re going to get a factory popping up, or a high-rise block of flats! You can look out and – I imagine – the landscape looks almost the same as it would have done a hundred years ago. A thousand years ago. More. 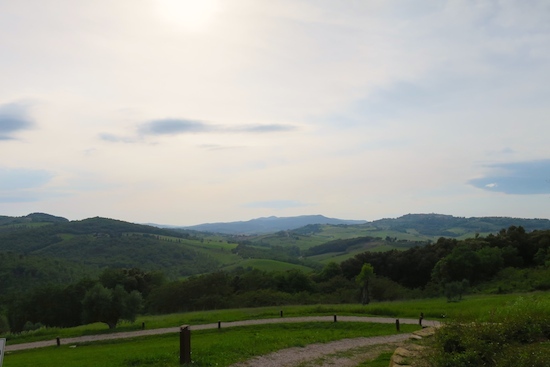 It’s just rolling countryside and a huge sky and the lovely hilltop town of Casole d’Elsa far up and away in the distance. And honestly? Really very lovely. And not that much smaller than the two-room suite that we had, though the decor is quite different. Same airy, oversized bathroom, though, so I’d say that the “entry level” option is far from being the “make do” option. 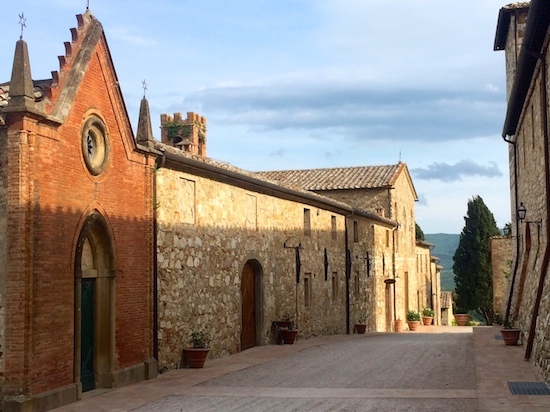 Castello di Casole isn’t one of those luxury places that hedges its bets – there are no “cheaper rooms” that are rubbish and boxy, just to get the numbers up. It’s all swish. Nice. I’m always just a little bit wary of restaurants that come with hotels. They can be quite hit and miss. On the one hand, you often have a very good chef-with-a-name attached to a hotel restaurant if it’s an expensive, well-known hotel, but on the other… The words “captive audience” spring to mind. Some hotels just know that their clientele will come to the restaurant by default and so they don’t make any real effort – I’ve been to some shockingly bad hotel restaurants. 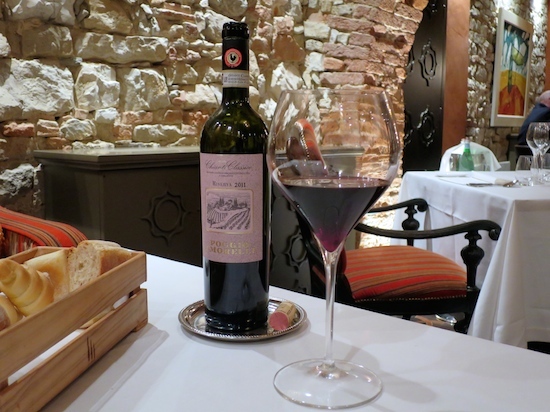 Tosca, however – the restaurant at Castello di Casole – is just fabulous. Everything that arrived at our table was beautiful and utterly delicious. I’d go so far as to say that the meals (we went both nights) were the best I’ve had this year. Up there with the roll-back-to-your-room feast that I had with my Mum at Les Etangs de Corot, and that place got its Michelin star shortly after I visited! 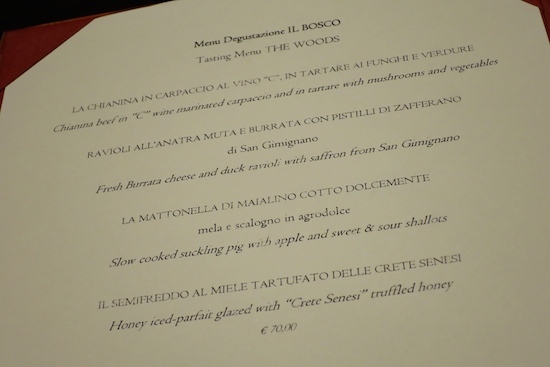 Mr AMR and I had the tasting menu on both nights of our stay – “The Woods” menu on the first night (menu pictured somewhere above) and the “Onion” tasting menu on the second. The “Onion” menu sounded weird but was absolutely divine. Every morsel that came out held a new joy, we were just beside ourselves with food pleasure! And Mr AMR very rarely enjoys a meal fully; he’s not by any means picky, but he expects food at high-brow places to be at least as tasty as what he gets at home. And it often isn’t. (According to him – I’m not blowing my own trumpet, here, as I do perform most of the culinary magic at home. He washes up.) So Mr AMR is quite a good barometer, really, for judging the success of a meal, which is one of the reasons I like taking him along on these trips. That and the fact that we are married, of course. Just a minor consideration. 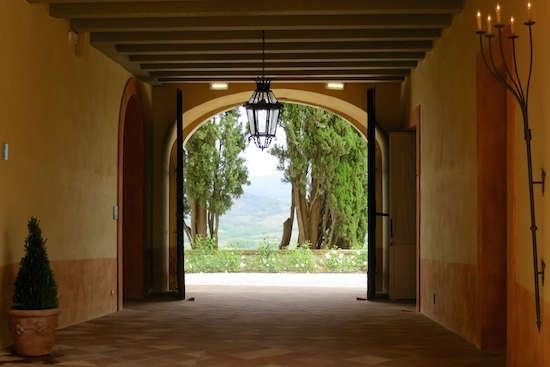 Castello di Casole is one hundred percent a luxury resort, but it has a charm and understated sophistication that many of these top-notch places lack. 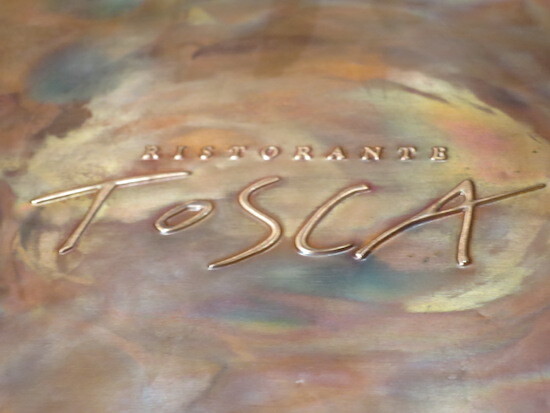 For me, it ticked every box; it had personality but was supremely comfortable, it had amazing food at Tosca and…the views. The views! It’s also surprisingly kid-friendly, with a cute little Pizzeria and Gelateria in the main square, but really? Go as a couple, kick back, relax. Be decadent. Take in the views. Do some Russell Crowe-as-Gladiator style roleplay…too far? OK. 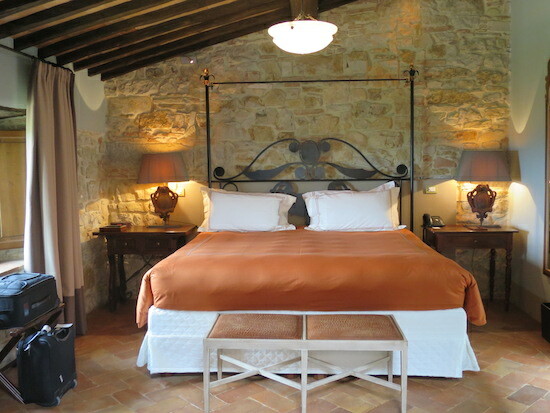 Rooms at Castello di Casole start at around £330 per night. For a very special occasion, such as a honeymoon, I would definitely say that paying the extra for a suite is money well spent. They have incredible views and are just so romantic. 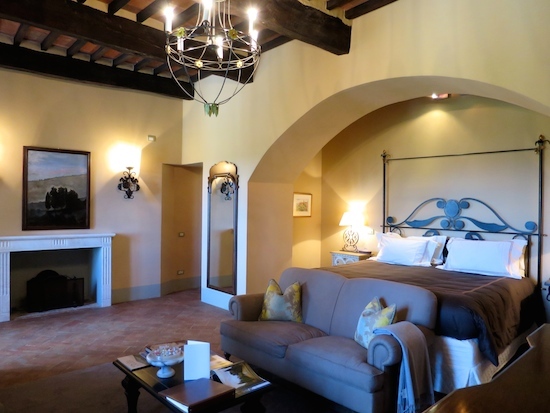 But as I said, the standard rooms are spacious and have huge bathtubs and walk-in showers and if you’re going to be spending most of your time by the pool, or exploring Tuscany, then they are a brilliant option. N.B. and disclaimer: there’s a drink called the Apple Sidecar that they serve in the bar. It’s epic. I want you to try it, but legally I hold no responsibility for you if you decide to have more than two. I woke up in the middle of the night thinking that Mr AMR was a dead FBI agent and that the KGB were outside the door. I also won at playing draughts, which means that Mr AMR’s White Russians were as strong as my Apple Sidecars because I never win. Ever. Previous Post Hot Red Lips and Flawless Skin. Next Post Jean Paul Gaultier Classique: Just Got A Lot Better.